Dozens of Quebecers took to the streets of Montreal's West Island Sunday to protest the unfulfilled promises that were made by its government in the wake of highly damaging summer floods. 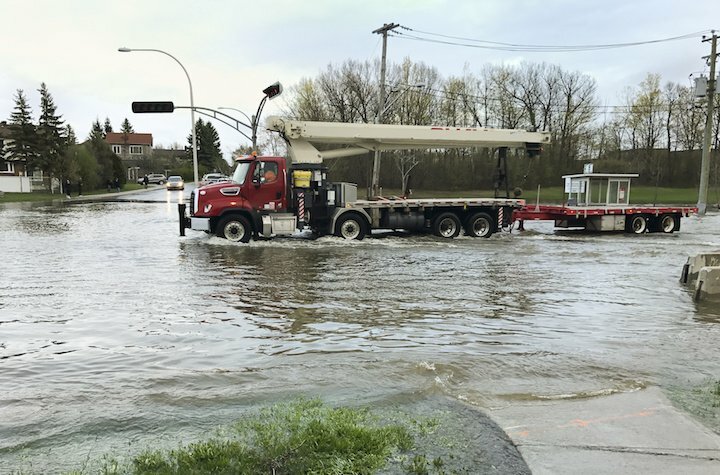 In early July, Quebec Public Security Minister Martin Coiteux pledged that his government would accelerate the damage assessment process and have flood inspection reports delivered within five weeks of an initial inspection. It had even hired 90 additional specialists to help accomplish that goal. But for many flood-affected residents, that target has not been met, and they are finding themselves ignored by a government that claimed to have their backs. "We feel betrayed, desperate," said Katy Deschenes, a Saint-Joseph-du-Lac homeowner who is still waiting on her flood inspection report/ "The government made us promises, they tell us everything will go well, then weeks later it's something else." Sadly these delays are more than annoying inconveniences. A number of residents have been unable to move back into their homes, or to begin commissioning repairs, as they don't know how much they assistance they will be able to receive. One protest participant, who lives on a pension, said her damages were estimated to be greater than $70,000. What's been especially frustrating for a lot of the affected homeowners is the lack of clarity surrounding the entire aid process, which has led to some people receiving money while others haven't. According to protest organizer Rene Leblanc, it's all been filled with "inconsistencies and misleading information." "I can't believe that this is the country that I know, the town the province where I live," he said. "Canada has always been known for its safety net, but it doesn't appear the system we thought was there to help us is actually there."